Born : on November 27th 1938. Education/Profession : Obtain a Bachelors Degree in Economics from London in 1964, A Master Degree in Political Science from Chicago in 1966 and a PhD from Nairobi in 1984. Dean, Faculty of Social Science. Head, Department of Political Science. Director, Makerere Institute of Social Research. Professor of Political Science and Public Administration. Vice Chairman of Council of The Christian University of East Africa. Political career : He was appointed to the portfolio of Prime Minister and Leader of Government Business in April 1999. Before then, he was the Minister of Education and Sports from May 1998 - April 1999 and Minister of Public Service from July 1996 - May 1998. Minister of Constitutional and Political Affairs and Human Rights in Buganda Kingdom. Education/Profession : He went to school at Kyamate Boys School, Mbarara High School, Ntare School and University of Dar Es Salaam where he graduated with an LLB in March 1970. He served as counterpart Lecturer at the Institute of Public Administration between April 1970 and 1971. In 1971 he became a State Attorny, Civil Section in the Attorney General's Chambers in Kampala. In 1972, entered Private Practice with Ibingira & Mulenga Advocates. Political career : Member of the National Consultative council-1979/80. Minister of Commerce,1980. During the period between 1981 - 1986, was active in the popular peoples struggle in the bush where he he served as Secretary for Political and Diplomatic Affairs, National Resistance Movement and Member of the High Command. He became a Minister of State, Office of the Prime Minister in 1986 and thereafter in 1988 till to date he is the First Deputy Prime Minister. National Political Commissar,1990-96. 1996 First Deputy Prime Minister and Minister of Foreign Affairs. Born : on 5th April 1939 at Meliaderi, Atabo Parish in Pakele Division in Adjumani District. Education/Profession : After completing his Ordinary Level Certificate at Old Kampala Senior Secondary School in 1966, Brig. Ali undertook a number of military training courses as a Cadet officer, Paratrooper Instructor in Uganda and Company Commanders Course in Israel in. In 1972, Brig. Ali enrolled in Staff College at Camberly in UK where he earned a Degree in Military Science. Brig. Moses is an active educationist and as recent as between 1998 - 1999, Brig. Ali did an external correspondence study with Holborn College of London. Brig. Ali was commissioned in 1969 to the rank of 2nd Lieutenant and appointed Officer -in-Charge of Training in the Uganda Paratrooper School. In 1971, he was promoted to the rank of Major and appointed Commandant of the Paratrooper School. Later in 1972, Brig. Ali was promoted to the rank of Colonel. Chairman of the Cabinet Central Economic Committee Chairman Central Tender Board. Governor of African Development Bank. Political career : In 1973, he was appointed Minister of Provincial Administration and in 1974 he was promoted to the rank of Brigadier. Brig. Moses Ali has also served in the following capacities : Minister of Youth, Culture and Sports. Minister of Tourism, Wildlife and Antiquities. Member of the National Resistance Council for Moyo District. Constituent Assembly Delegate for East Moyo County. Member of Appointment Committee of Uganda Parliament. Elected member of Parliament of Adjumani District. Political career : Former National Political Commissar. Note : Moved from State for Trade and Industry Ministry. Replacing Dr. Ruhakana Rugunda. Born : on the 16th January 1949 in Mpiro, Kigezi. Education/Profession : He holds a Law (LLB) Degree from Makerere University, Kampala (1975) and a Post Graduate Diploma in Legal Practice from the Law Development Centre. He is an Advocate of the Courts of Judicature of Uganda and a member of the Uganda Law Society since 1977. Professionally, he worked as State Attorney in the Attorney General's Chambers, rising to the position of Secretary of the Uganda Law Council. Political career : External Security Organization chief. Minister of State for Regional Cooperation. Mr. Mbabazi, is Uganda's Minister of State for Foreign Affairs in charge of regional cooperation and current Chairman of the Permanent Tripartite Commission of the East African Cooperation. He is the Member of Parliament for Kinkizi West. He previously held the portfolios of Minister of State in the President's office, in-charge of Political Affairs and Minister State for Defence from 1986-1992. Education/Profession : St Mary's College Kisubi : 1951 - 1953 : Cambridge School Certificate, Grade 1 ; Makerere University College : 1954 - 1956 : Intermediate of the University of London Makerere University College : 1956 - 1958 : B.A of University of London ; Oxford University U.K: 1958 - 1959 : Devonshire Post Graduate Administrative Course ; University of Wisconsin USA : Centre for Advanced Study in Organisation Science Milwaukee 1964. Director of Recruitment and Training E.A Common Services Organisation 1964 - 1966. Deputy General Manager (under study) Bank of Uganda 1966 - 1967. Secretary E.A. Development Bank 1967 - 1973. Chairman/Managing Director Uganda Commercial Bank 1973 - 1978. Ag. Director General E.A Development Bank 1978 -1979 concurrently with being Governor Bank of Uganda 1978 - 1979. 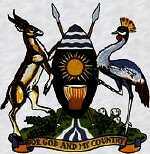 Political career : Administrative Officer, Uganda Government 1958 - 1962 Under Secretary : E.A. Common Services Organisation, Nairobi, Kenya 1963 - 1964. Chairman LC V Hoima District 1988/1989. Minister of Water and Mineral Development 1989 -1992. Minister of Natural Resources 1992 - 1996. Minister of Trade and Industry 1996 - 1997. Minister of Water, Lands and Environment 1998 - 2001. Note : Former Minister of Water, Lands and Environemment. Replacing Amanya Mushega who is now the Secretary General of the East African Co-operation. Born : on January 1952 in Kazo in Mbarara District. Education/Profession : He holds a BSc. Degree in Civil Engineering from the University of Nairobi. John Nasasira is also a qualified Chattered Engineer of UK. He is a member of the following professional bodies : The Uganda Institute of Professional Engineers. The Institute of Engineers of Kenya. The Institution of Engineers (UK). Political career : Deputy Minister of Works (April 1989 -1991). Presidential Advisor on Public Works (July 1991 - Mar 19992). Deputy Minister of Works, Transport and Communications (Apr. 1992 - Nov. 1994) Minister of State for Agriculture, Animal Industry and Fisheries (Dec. 1994 - Nov. 1994). Minister of Agriculture, Animal Industry and Fisheries (Dec. 1994 - June 1995). Delegate to Constituent Assembly (1994 - 1995). Minister of Works, Transport and Communications (July 1996- July 1998). John Nasasira is a member of Parliament for Kazo County. Born : on 18th December 1934 in Kabarole District. Born : on the 7th November 1947 in Kabale District. Education/Profession : He attended Kigezi High School and Busoga College Mwiri before joining Makerere University and later went on to the University of Zambia where he qualified in Medicine with an MB.CH.B Degree. Thereafter, studied at the University of California - Berkley in the USA and obtained a Masters Degree in Public Health (MPH). Worked as Medical Officer in Zambia and a Resident Physician in Pediatrics at Washington DC General Hospital in the USA. Thereafter, he worked in the Department of Pediatrics at Kenyatta National Hospital in Kenya. Political career : Dr. Rugunda has served in various portfolios including the following : Minister of Health. Minister of Foreign Affairs. Minister of Information. Minister of Works, Transport and Communication. Commissioner for Animal Industry, Game and Fisheries. Dr. Ruhakana Rugunda is the member of Parliament for Kabale Municipality. Note : ex Minister to the Presidency.